Beyond the trees full of lots of blooms this week has some significant updates on blues news items found below. The most important is the date and location are now available for the 2019 annual membership meeting. We are holding an old school PARTY this year as a thank you event for our members! The "meeting" convenes on Friday, May 17th at 7pm at The Meteor Guitar Gallery in Bentonville. Admission is free for current members and others may buy tickets/memberships at the door for $15. The music for the evening will include The Dawn Cate Band as well as a jam. Read on below for more information. 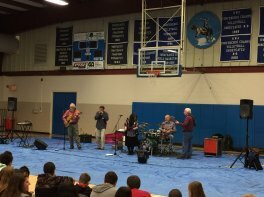 Blues in the Schools has wrapped up our 2018-2019 school year but we are looking to plan more events for 2019-2020. Check out the article below to find out how you can get involved! have included a couple for this week. 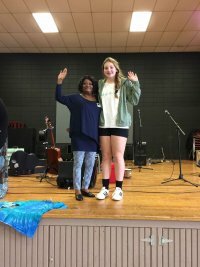 As the 2018-2019 school year comes to a close, Ozark Blues Society is excited and honored to have once again to have had the opportunity to bring Blues Education to more than 700 young people in Fayetteville. We once again shared with the 7th grade students in Fayetteville Public Schools as well as a history class at Hass Hall Academy. As always our first round of thanks go out to our local musicians who join us in our desire to keep the blues alive for the next generation. For this year, we specifically want to thank Tony Redman, The Brick Fields Band, Ocie Fisher, and Buddy Shute and the Motivators! With nearly ten years of outreach under our belts we have a multitude of experience of working with teachers and local artists in both small and large group settings. We meld a music oriented outreach that is fun for students with curriculum study points provided by the teachers, and present the vibrant history of the American art form known as blues. As we close this year's activities the OBS Board of directors is looking forward to the the 2019-2020 school year. If you are a teacher, know a teacher, or are a parent who feels your class or school would benefit from a blues education program, please contact Sandy McCann. Below is just a sample of the experience. Thank you Woodland and Ramey Junior High Schools for hosting us! vote. Email Bill if you wish to nominate through this process. The annual meeting is slated to be held on Friday, May 17 from 7-10 pm at the Meteor Guitar Gallery. Admission is free to current members. Tickets/memberships may be bought at the door for $15. The event will include live music by The Dawn Cate Band, followed by a jam. Email LIZ LOTTMANN for more information or to be included in the jam. The board is also seeking to add new members to the board itself. Please feel free to recommend someone you think might be a good fit, or you may volunteer yourself! Again, email Liz (above) with contact information. "The blues are the roots and the other musics are the fruits. It's better keeping the roots alive, because it means better fruits from now on. The blues are the roots of all American music. As long as American music survives, so will the blues."